Man, I don’t even mention some of the great stuff with Galactus – like his origin story is in this run! Last week I mentioned that I was reading Jonathan Hickman’s run on Fantastic Four and FF (Future Foundation), timed in relation to the Fantastic Four movie coming out. Well, it wasn’t really related to the movie… but it was a great run of comics, and I thought I’d lay out a few reasons why here. I had not quite realized that he wrapped up on Fantastic Four and FF just a couple months before he got going on the Avengers titles, so he got the chance to set up his characters and foreshadow a lot by the end of the run, which I thoroughly enjoyed. However, he also did a lot of things within these series that were just a lot of fun themselves. In short, these are a great read – Fantastic Four 570-588 & 600-611, and FF 1-23! 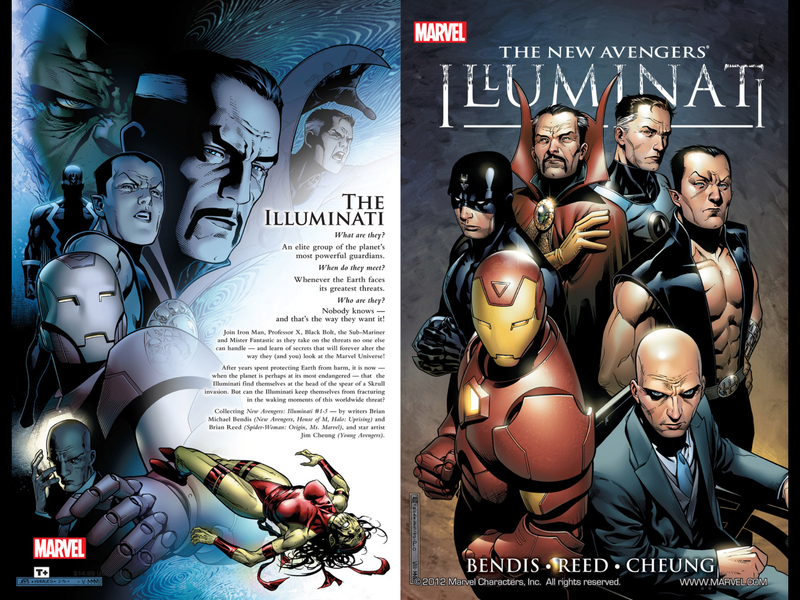 It’s no secret that I’m a fan of Jonathan Hickman’s comics – even if there is a strange obsession with the Illuminati in them… Last week, the two main Marvel comics he had been writing, Avengers and New Avengers, had their last trade paperback come out. Having devoured that, and done some digesting, I thought I would share some of my thoughts on the action and reveals therein. I opened with a review today on Sourcerer, where I gave some broad strokes about Hickman’s two comics, and about the last four trades and storyline – Time Runs Out – in particular. Well, I haven’t spun much theorycraft about these comics for a bit (not much since Infinity!) but that works, because many of the answers have only come recently. So if you’re wanting a low-spoilers comics review of Time Runs Out, check out my Sourcerer post. If you’re wanting spoiler land and to talk about these comics, then this is the post for you! Read on, and some images to follow as well! Then last week, DC announced all of their movies between now and 2020. I haven’t even had a chance to talk about these – so check out the post about them on We Minored in Film to cover that! The announcements are both exciting and expected, as they are movies for the members of the Justice League. The Marvel equivalent would be announcing Hawkeye, Hulk, and Black Widow movies to go with the existing titles. And I feel that there’s an element of DC forcing this play, but maybe it was always planned. Marvel announced all of Phase 3, all in one go! With release dates, subtitles, and everything! I should add, though, that it seems their plan was to announce all of these movies – and then show the trailer for Age of Ultron that evening. By which point, there would have been way too much for one day. Alright, so to try to keep this halfway manageable, there’s a great article on The Mary Sue about the movie announcements already. So I’m going to add a bit of my own speculation and excitement about the movies! Update: Also, check out some thoughts from We Minored in Film: the good and the bad. There’s one theme that I keep seeing between all of his comics I’ve read so far. And one theme that has led to my Hickman posts being some of the most popular I have written here on Comparative Geeks. The Illuminati. This image I think comes up on Google if you search right. Something about this theme – about the men of power who secretly run the world – is appealing to Hickman. It makes them a villain that can be defeated, makes the world something that – through a contest of will – can be changed. It makes for great story-telling; but does it tell us anything about the Illuminati themselves? Let me work through the comics and consider! Posted in Comics, Good and Evil, Meta, Science! After we ended the A to Z Challenge in early May I did a post about how we had so many things to talk about, so many games to play, so many movies to see and shows to watch. Now we’re in summer, and while the blockbusters have hit (especially a lot of the LitFlix), the shows have ended (even Game of Thrones! ), and we have time to breathe. We also have some of the time-sinks in our personal lives past us. So where are we at? What are we up to? I thought I would highlight some of our thoughts on topics moving forward, and some of the things we’ve crossed off that ambitious list of topics. Onward!